Yuki Satoshi 9P’s Good Form Continues: The ‘good week’ described in our previous report (Power Report, 4/1 EJ) looks like turning into a good month for Yuki Satoshi 9P (right). The third game of the 51st Judan title match was played at the Kuroyon Royal Hotel in the city of Omachi in Nagano Prefectures on April 4. 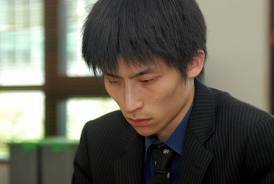 Taking black, Yuki forced the titleholder, Iyama Yuta, to resign after 189 moves, so he took a 2-1 lead in the series. He is now just one win away from taking his second top-seven title. This was Yuki’s third win in a row against Iyama, so he is exacting some revenge for the ten successive losses he suffered previously. The fourth game will be played on April 18. Iyama’s Sextuple Crown in Danger? Past records of multiple crowns show that they don’t usually last very long, usually less than a year (a detailed listing is given on page 6 of Go World 129). Iyama Yuta 9P (right) picked up his quintuple crown in November 22 last year and is in no danger of losing it for a few months yet, but his sextuple crown, acquired as recently as March 14, already seems to be in some danger. Many fans in Japan are rooting for him to score a genuine grand slam by winning all seven top titles, but first he has to defend the ones he already has. Cho U Keeps Sole Lead in Meijin League: A week ago, Cho U (left) lost his share of the lead in the current Honinbo League, but he remains the sole leader in the 38th Meijin League. 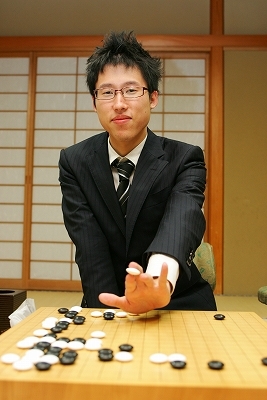 In a game played on April 4, he defeated Sakai Hideyuki 9P by 2.5 points to extend his score to 4-0. Cho is the only undefeated player, but he is closely followed by Hane Naoki 9P and Iyama Yuta, who are both on 3-1. To have a shot at a grand slam, Iyama’s first task is to overhaul Cho. In another game played on the same day, Takao Shinji 9P (black) beat Mizokami Tomochika 8P by resignation.